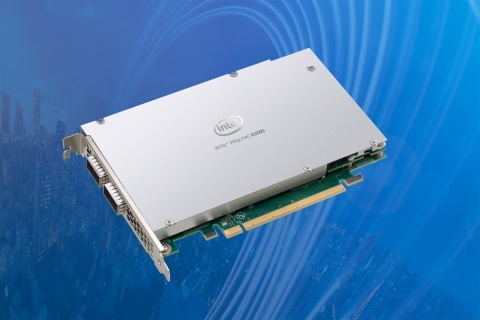 What’s New: Today at Mobile World Congress (MWC) 2019, Intel announced the Intel® FPGA Programmable Acceleration Card N3000 (Intel® FPGA PAC N3000), designed for service providers to enable 5G next-generation core and virtualized radio access network solutions. The Intel FPGA PAC N3000 accelerates many virtualized workloads, ranging from 5G radio access networks to core network applications. Why It’s Important: Telecommunications service providers face rapidly growing usage demands. Global internet protocol (IP) traffic is expected to increase threefold over the next five years.1 The exponential increase of mobile subscribers, internet of things devices and 5G use cases adds to the complexity and cost of network build-out and operations. Many new use cases require low latency and high bandwidth and can generate new revenue streams for the service providers while reducing the total cost of ownership. What It Does: Intel FPGA PAC N3000 is a highly customizable platform enabling high throughput, lower latency and high-bandwidth applications. It allows for optimization of data plane performance to achieve lower costs while maintaining a high degree of flexibility. Support of end-to end industry standard and open source tools allows users to adapt quickly to evolving workloads and standards. How It Works: Intel FPGA PAC N3000 for networking is designed to accelerate network traffic for up to 100 Gbps and supports up to 9GB DDR4 and 144MB QDR IV memory for high-performance applications. Programmability and flexibility of an FPGA allow customers to create tailored solutions by utilizing reference IPs for networking function acceleration workloads such as vRAN, vBNG, vEPC, IPSec and VPP. 5G core solution: Affirmed Networks* offers virtualized cloud-native mobile network solutions for 5G. By working with Intel’s FPGA PAC, it developed a new solution for 5G core network (CN)/evolved packet core – the first true 200 Gbps/server. Intel FPGAs for smart load balancing and CPU cache optimizations enhance software performance. They also provide lower power consumption and lower latency for diverse quality of service characteristics across multiple network slices for 5G. Affirmed Networks 5G Core Network will be demonstrated in the Intel booth at MWC. Edge: Rakuten*, a leading global innovation company in e-commerce, communications and financial technology, and soon to be the operator of Japan’s newest and most innovative mobile network, is including Intel x86 and FPGA-based PAC for acceleration from the core to the edge to provide the first end-to-end cloud-native mobile network. Intel FPGA PAC N3000 is the distributed unit accelerator next to Intel® Xeon® Scalable processor where Layer 1 functions, such as forward error correction and front haul transmission, are offloaded onto an Intel FPGA. The Intel FPGA accelerates processing efficiency to improve and support user capacity, as well as reduce system cost and provide more security in the radio network. 1 Cisco Visual Networking Index: Forecast and Trends, 2017–2022 - Cisco. 2 Tests were conducted by Affirmed Networks. Affirmed Networks, the Affirmed logo, Affirmed Networks Mobile Content Cloud are trademarks of Affirmed Networks in the U.S. and/or other countries. The benchmark results may need to be revised as additional testing is conducted. The results depend on the specific platform configurations and workloads utilized in the testing, and may not be applicable to any particular user's components, computer system or workloads. The results are not necessarily representative of other benchmarks and other benchmark results may show greater or lesser impact from mitigations. Software and workloads used in performance tests may have been optimized for performance only on Intel microprocessors. Performance tests, such as SYSmark and MobileMark, are measured using specific computer systems, components, software, operations and functions. Any change to any of those factors may cause the results to vary. You should consult other information and performance tests to assist you in fully evaluating your contemplated purchases, including the performance of that product when combined with other products.